I can’t get my win at the Mohican Trail 100-Mile Run out of my mind. After a few days, it finally sunk in, but I don't really know what it means yet. Over the past several days, I’ve gotten e-mails and phone calls from folks congratulating me. I really appreciate this and am humbled by the whole experience. 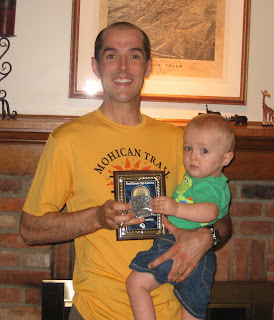 As part of tradition now, here Noah and I are holding the race hardware--my Mohican 100 buckle and winner's plaque. I also received a generous cash prize and am waiting a nice prize package from title sponsor The North Face, which is comping my entry into The North Face Endurance Challenge Championship, a 50-miler in San Francisco on Dec. 5. My status for that race is yet to be determined. Wyatt, this note is way overdue. I have wanted to let you know how impressed I am with not only your win but the way you trained for the 100 mile. You are a champion. I would have never thought that you would be completing, much less win, a 100 mile race when I first met you. I remember the call when you first moved here and thought you were like so many others that come and run once and never come back because they get intimidated. I believe SERC has helped you become a true competitor. Maybe that’s why SERC has not only the best runners in Cleveland but we have national and even international class runners. SERC now has another elite runner in our club. You should be very proud. Congratulations, Wyatt. To have taken the lead at mile 85 or 86 (still don’t know exactly where) and held off two excellent, accomplished runners in the end—Matt Aro of Minnesota and Mark Tanaka of California—provides me with a real sense of accomplishment. When I reflect on how I was able to pull off the win late in the race, three thoughts come to mind. First, I just didn’t ever really stop. I walked only the big hills and, when I walked, I power-walked them hard—arms pumping and body upright. All other times I just ran, to quote Forest Gump. I think the hill repeats I was doing in the weeks leading up to Mohican really paid off. Second, I didn’t spend hardly any time at the aid stations. If I needed something, such as soup, either Kenny or Dan as my pacers (politely) yelled in my request as I was coming into the station, and then I took it from the volunteer (always thanking them) and was on my way. If I had to get something from my drop bag—shoes, headlamp, etc.—I retrieved the item(s) as quickly as possible. 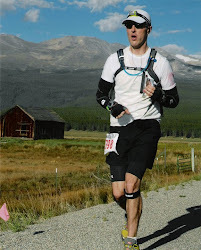 One-hundred mile trail races can be won by limiting time at aid stations. Easier said than done. You just want to sit down and rest. Third, I wanted the win and was willing to put it all on the line to cross the finish first. Nothing was going to stop me. I think in this area--mental toughness, tenacity and competitiveness--I've learned a lot from guys like Mark and Steve Godale, Tim Clement and Kam Lee, all of whom I'm fortunate to run with in the Cleveland Southeast Running Club. These guys are true competitors who've won big races and won't be denied. It's amazing to me how many non-runners I know who've congratulated me on the Mohican win didn't know it was even possible to run 100 miles. They tell me that the thought of 2 or 3 miles is horrifying enough and question whether it's really good for the body to go 100 miles. "People run 100 miles all the time," I tell them, citing the rising popularity of ultrarunning. I also tell them of the Tarahumara Indians of Mexico's Copper Canyons and other peoples around the world who cover extraordinary distances on foot as part of their daily life. "We were born to run great distances," I tell them. It's not surprising most people think 26.2 miles is as far as the body can--or should--go. We live in a world of ever-increasing comfort. On a given summer day with the sun shining, the average American probably spends 22 of 24 hours inside breathing artificially cooled air--8 hours at work, 2 hours in the car, 8 hours of sleep and 4 hours in between watching TV, eating, working out in the gym, shopping, hanging out at Starbucks, playing video games, surfing the Web (which I'm guilty off now and then), etc. The expectation is for the world to provide comfort. Comfort is almost a right now--up there with life, liberty and the pursuit of happiness. Can you imagine the founding fathers defining our God-given rights as the rights to life, liberty, the pursuit of happiness...and comfort? But comfort is over-rated. If you're comfortable all the time, how can you really discover what you're made of, push the limits and achieve great things? I think of Theodore Roosevelt's famous quote about the man in the arena. He puts himself in the arena, risking defeat, but at least he's put himself in a position to achieve victory and do great things. The man who neither knows victory nor defeat is the poorest of souls. That's basically what TR said, it's the motto by which we should all live. As a guy who wears a suit and tie to the office, works at a desk, sits in meetings and breathes air-conditioned air every day from 8-5, I have to constantly work to keep myself from living a life that is too comfortable. It's good to get muddy, uncomfortable and primal now and then. Twenty-first century life wants to hold us back, to keep us down. We can't let it. I guess it’s time to start thinking about what’s next on the race calendar, but the more immediate goal is to recover over the next few weeks. I'm going to ease back into running and not push things too hard right now, which means I won't be running in the Burning River 100 on August 1-2 and will instead once again pace Tim Clement. I’m fortunate to have gotten through Mohican without any injuries—just your usual fatigue and soreness—and now I need to get back to 100 percent so I can compete again. But, in the meantime, I want to decide on what will be my next race and start focusing on it. There’s a 50-miler in West Virginia, the Cheat Mountain Moonshine Madness, on August 28-29 that looks interesting. It starts at night and traverses mountains near where I went to college. But I'm not sure I want my first 50-miler to be a night race and, besides, that weekend isn't looking good schedule-wise. The race I'm most leaning toward is the Tussey Mountainback 50-Mile in Central Pennsylvania, which will again host the USA Track & Field 50-mile national championship. Tussey has over 10,000 feet of climb and descent and is run mostly on dirst roads. To prepare for such a race, I'd need to emphasize speed and hills along with a steady high-mileage diet. As an alternative to the Tussey Mountainback, there's the North Coast 24-Hour Endurance Run here in Cleveland on October 3-4. It’s hosting the 24-hour national championship. While running on a .9-mile paved loop for 24 hours doesn’t exactly appeal to me, I would love a shot at the national team but realize I’m not a big name and might not have a real shot at the team unless I won the damned thing (which I probably wouldn’t). Farther out, there’s The North Face Endurance Challenge Championship, a very challenging 50-miler in San Francisco, on December 5. My Mohican win allows me to enter this race free-of-charge. I’m seriously considering it, but I want to find a race to do between now and then. I know where I have the best shot at competing and it’s at the 100+ mile level. I don’t quite have the speed to be highly competitive at the 50K level. I’ve never done a true 50-miler and so I don’t know what kind of time I’d collect. We may find out soon enough when/if I run the Tussey Mountainback. Bottom line: I want to see what I can do and where I can go. Maybe somewhere. Maybe no where. But why not find out? It sure beats the hell out of being comfortable. 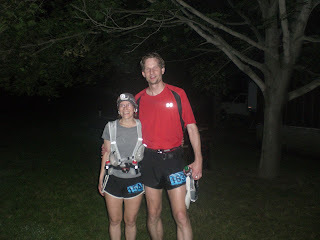 Everything fell into place at the 2009 Mohican Trail 100-Mile Run. In what can only be described as a surreal, almost out-of-body experience, I won outright with a time of 19:52, having taken the lead around mile 85 (a few miles beyond the Bridle Staging Area aid station) and never relinquishing it (finish-line photo below). Congratulations to top female finisher Jenny Chow, who also was the top female at the Kettle Moraine 100 only two weeks earlier (amazing!) and all the finishers of both the 100- and 50-mile races at Mohican. Photo courtesy of Mike Keller. Winning the Mohican 100 is a dream come true. I wanted so much to win last year's race and things turned south with my knee and stomach. To have won in 2009 after working so hard, keeping the faith and putting in so much time with my training feels really good. The road to the 2009 Mohican saw two top-five 50K finishes (Lt. JC Stone 50K in March and the Forget the PR Mohican 50K in April) and a 2:59 marathon (Cleveland Marathon in May). It all came together on June 20-21 at Mohican. Coming into the Bridle Staging Area aid station--about mile 45.2. The Outdoor Research safari hat really worked for me, keeping the sun out of my eyes and my head cool. In case you're wondering, the red writing on my left arm said "Noah." Photo courtesy of Mark Shelton. 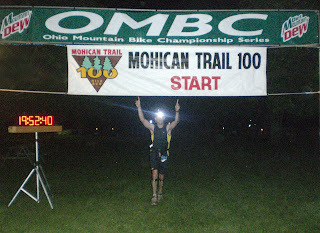 This year marked the 20th anniversary of the Mohican 100. The race served as the Midwest Regional Championship of the Road Runners' Club of America. By virtue of my win, I now have a comped entry into The North Face Endurance Challenge Championship, a 50-mile event (called the Gore-Tex 50 Mile) in San Francisco on December 5 that will join many accomplished ultrarunners. At this point, I'd say my participation is probable. It's hard to believe this is really happening. For the entire race I felt relatively good and went through the normal ups and downs of a 100-miler. I had no knee problems (unlike last year's Mohican)--perhaps because of my new Pro-Tec wraps--and my stomach held up very well (again, unlike last year). The last 60 miles I survived on soup, bananas, Hammer gels, Gatorade and water, along with Hammer Endurolytes and three Advils. I also took Red Bull at a few points. Top woman Jenny Chow after finishing. Congrats, Jenny! Photo courtesy of Mike Keller. It rained like crazy on Friday night and also on Saturday morning only minutes before the 5 a.m. start. The rain came down so hard that many of the lime markings washed away and several sections were reduced to deep mud. The temperature hit the low-to-mid 80s and it was pretty humid the whole day. The mud and humidity certainly caused some slower times this year. With many of the markings washed away, there were a few areas where I had to run on memory from last year and fortunately I stayed on course except for a section of the purple loop where Jay Smithberger (winner of last year's Mohican) and I got off course but quickly got back on without losing much time. By the time I went through the course the second time many areas were re-marked. A few folks have griped about the washed-out markings. With rain coming in when it did, what were the organizers to do? They re-marked the course as quickly as possible. I ran the first 60 miles somewhat conservatively--but with an eye on the top spot--and then let it go the last 40 miles. I never really stopped running even late in the race. I think the hill repeats I started doing a few months before the race really paid off. There were a few big hills that I power-walked, but for the most part I ran the last 40 miles of the race, stopping at the aid stations for no more than a minute or so. I learned a lot from Tim Clement, who I paced to his Burning River 100 win in 2008. Tim never gave up, never stopped and kept going. From him I saw firsthand how to win a 100-miler. When I entered the Covered Bridge aid station at mile 80.9, I was stoked. A volunteer came up to me and said, "The leader's 30 minutes ahead and is worried about you gaining on him." From what others have told me, apparently my response was, "Well, he'd better be because I'm coming after him." When I entered the Bridle Staging Area (mile 83.6), I was in third place, behind front runner Mark Tanaka of San Francisco, a well-known ultrarunner who is on the La Sportiva mountain running team, and the very strong, focused Matt Aro of Minnesota, winner of the 2008 Headlands Hundred and a highly accomplished Ironman triathlete who's placed #1 and #2 in a few double Ironmans--yes, doubles. I hadn't seen Mark all race; Matt had passed me around mile 65 or so as I was running (which was very discouraging because I felt strong as he passed me). But I left the Bridle Staging Area before Matt and was thus in second place behind Mark. A few miles later--around mile 85 on the long, muddy and wet 7.3-mile stretch between the Bridle Staging Area and Rock Point aid stations--I took the lead. It was pitch-black dark when we came upon the leader, Mark. Upon taking over the lead, I just kept going and didn't stop with Matt and Mark on my heels. Going into the mile-90.8 Rock Point aid station, the plan was to change into some dry shoes. But with the whole enchilada on the line, I told my pacers, Kenny M. and Dan C., that plan was now out the window--I was getting my back-up headlamp and some soup and was going. As I left Rock Point, Matt and Mark were coming into the aid station. I knew these final 10 miles were going to be a war--a street fight actually--and only one of us would be crossing that finish line first. We went stealth--no lights--for a few stretches in the hopes of discouraging the fellow(s) behind us. But it was just too damned dark to go stealth the whole way, and there was too much on the line. A missed turn would have been a disaster. Around mile 91, we saw someone coming at us. As we got closer, I heard a familiar voice. "Is that Wyatt...Wyatt?" It was my Saturday morning training partner and fellow Southeast Running Club member Tim Clement, winner of the 2008 Burning River 100, where I'd paced him to his win. I was elated to see Tim and asked him to help guide me to a winning finish. Entering the mile-95.9 Landoll's Castle aid station, all I needed was some more soup and Gatorade. I took it and left, hoping a short stop there would discourage the competition. I didn't see Matt and Mark at that point, but I felt enormous pressure to keep going because I knew how strong and capable they were, and how much they themselves wanted to win. Tim fell back a little to see what was going on at Landoll's after we'd gone through. When he caught back up to us about five minutes later, I said, "I don't wanna know what you saw back there. I just need to keep going and focus on the finish." All mentions of Mark and Matt met the same response from me: "I'm not worried about them." That was a lie. I was very worried about where they were, and maybe that's why I kept asking Kenny, Dan and Tim to look back and tell me if they saw any approaching lights. But in my head, I knew that so long as I kept running, I'd hold off those guys. If I walked, I'd be passed. Simple as that. I ran the last 5 miles with everything I had, continually asking my pacers to check behind us. No one was there, they kept reporting back. I kept thinking how awful it was last year to see no one behind us as we closed in on the finish, and then suddenly there was Connie Gardner chasing us down out of no where. Although I'd managed to hold off Connie, I didn't want to go through that this year. And so I ran! I was practically wailing in pain going down Big Hill, a long, steep and very rocky hill about a mile from the finish. When we got to the bottom of the hill and onto the home stretch, I opened up my stride a little and took it in. "You have 1200 meters to go," Kenny said. "How do you know that?" I asked, looking for reassurance. "I measured it by car this morning," he replied. That's three laps around the track, I thought. Finally, I saw the lights of the campground. The finish was now in sight. I entered the campground's gravel driveway and ran down toward the finish line area. "Be sure to hold those arms high when you go in," Tim said. Crossing the finish line with my arms raised and cameras flashing was a surreal moment. I finished in 19:52:40--about 20 minutes faster than the next runner in. Upon crossing, I became emotional and had a few minutes to myself before walking back to the finish. I was dazed. Colleen T., a longtime volunteer and Mohican historian, handed me a beer, but I couldn't stomach it. I called Anne to tell her the news. Then I called my mom and dad and brother. They couldn't believe it. Neither could I. I was waiting to awaken from this dream. Right after the finish. I'm trying to get some photos of Dan, Kenny and Tim and will post them when/if I get them. Photo courtesy of Mike Keller. About 20 minutes after I crossed, the second-place finisher, Matt Aro, came in, looking very strong. Soon after Mark Tanaka finished third, also looking strong. Congrats to both of them--they're very good runners and we had a heck of a battle. It's hard to describe what it felt like to win Mohican. I felt like Rocky after he knocked out Apollo Creed. I've always identified with Rocky--maybe not the most talented runner, but a runner and person who works hard for what he gets and plugs every step of the way. Here Anne, Noah and I are at the awards ceremony. Noah's holding our winner's plaque. 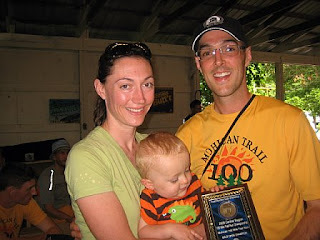 Without Anne and Noah, this Mohican 100 win wouldn't have happened. The win at Mohican would never have been possible without the love and support of my wife, Anne, and the inspiration of our son, Noah. She and Noah were with me every step of the way and seeing them at some of the aid stations late in the race really gave me extra motivation. In a very real sense, Anne and I did this together. I also want to thank my entire family, including Mom & Dad, Will, Gretchen & Alex, Gramma, Doug & Karen, Allison, Dan & Ella, and the Curtis family (who got me into running when I was a kid). A special thanks to my friends in the Southeast Running Club and to my former compadres of the Wabash River Runner's Club in Lafayette-West Lafayette, Indiana. Thanks to my friend Ted F., who has always been very encouraging and who finished his first 50 at Mohican this year. Congrats, Ted! Thanks to my boss, Michele, and all those who I am fortunate to work with at University Hospitals for their support and encouragement of my running. Thanks also to Ryan O'Dell, race director for Mohican, and the team of volunteers who made the race possible. And thanks to all the readers of this blog who have been so encouraging all along. I owe a huge thanks to my pacers, Dan and Kenny. Dan paced me the last 40 miles, and Kenny, who's paced me at all three 100s I've done, joined me for the final 25 miles. They did an outstanding job of keeping me on track. As I said, at about mile 91 we unexpectedly came upon fellow SERC member and training partner Tim Clement, winner of the 2008 Burning River 100, who drove down to Mohican to help me finish and to also see the action. 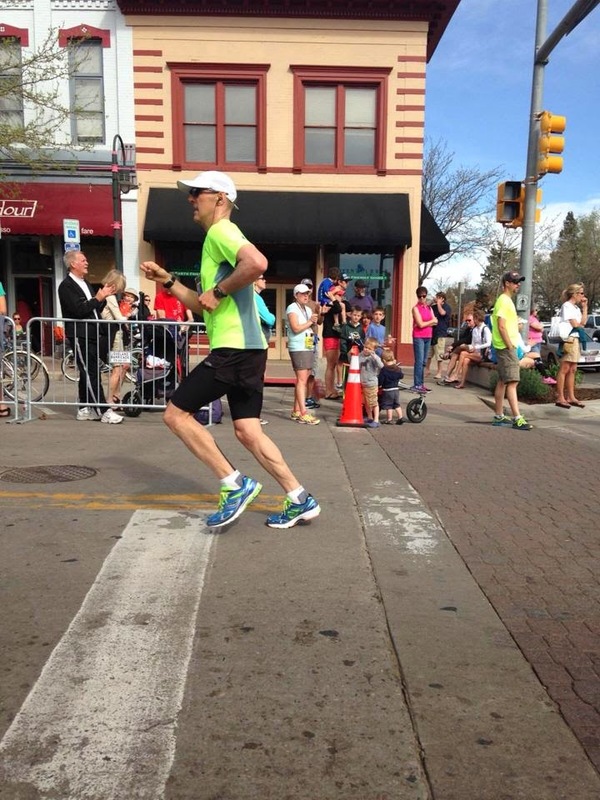 Tim's experience as a winning ultrarunner really helped me stay focused the final 9 miles. When I think of what Dan, Kenny and Tim did, I can't find the words to adequately express my thanks. My ultimate thanks goes to God for the strength to persevere in the race and in life. Without Him, none of this would be possible. The Mohican 100 is now just 48 hours away. At this point, all I can do is just hope for continued good health. This week has been pretty relaxing. I ran 4 miles on Tuesday, walked 2.5 miles on Wednesday and this morning walked 2.5 miles while pushing Noah in his stroller. Over the past few days, I've devised a race strategy and communicated extensively with my crew/pacers, Kenny M. and Dan C. of my former stomping ground in Indiana. I have total confidence in Kenny and Dan. Kenny, who is 20 states into his 50-state assault, has paced me at both of my previous 100s--the 2007 Burning River and 2008 Mohican. He carefully studies the course beforehand and does a great job of thinking for me late in the race. 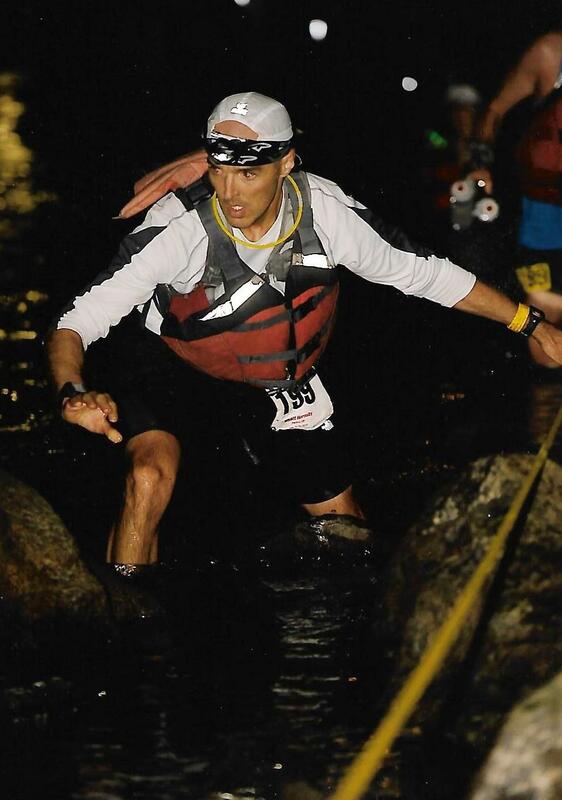 Dan is an experienced ultra runner and previously participated in competitive canoeing, which involves a lot of strategy and teamwork. I'm really excited to have both Kenny and Dan on board. With 23,000 feet of climb and descent, the Mohican course is fairly challenging. There are a lot of ups and downs and the final 10 miles, which are on gravel road, are punishing with constant hills and rocky footing. By contrast, the Burning River 100, while challenging in its own right, is pretty easy the final 10 miles with plenty of flat areas that allow you to shuffle along. But most everything is relative. The Hardrock 100 has 66,000 feet of climb and descent, with an average elevation of 12,000 feet. The Western States 100 has over 40,000 feet of climb and descent. It's important to keep things in perspective. Because Mohican repeats several sections and uses aid stations multiple times, you don't have to pack a lot of drop bags. For example, you go through the Covered Bridge aid station, a.k.a., Grand Central Station, five times, including once after the always-fun river crossing. That said, it's always kind of stressful getting my drop bags ready because I have to plan for everything that could go wrong (but, in reality, probably won't go wrong). I've found in both 100s I've run that I haven't used my drop bags as much as I thought I would. At last year's Mohican, really all I needed were a change of shoes after the river crossing and some Pepto Bismol and more toilet paper after mile 80. Oh, and a new knee! So, yeah, I'm a little nervous about Saturday, as any runner would be, but I'm also excited. It's not every day that you get to spend so much time in nature, so focused on the task at hand that you're free of the daily grind of life if just for that one day. All I'll be missing are Anne and Noah and our dog, Sophie, who I wish could run with me. I'll also find comfort in knowing that while most people think running 100 miles is crazy, humans were in fact born to run such distances. I think of the Kalahari bushmen and the Tarahumara and Raramuri people of Northern Mexico who run scores of miles chasing down animals to their death--a now-rare practice known as persistence hunting. The animals being chase by the hunters, while much faster in short bursts, are no match over the long haul due to their inability to keep cool and recover on the run. Not so with humans. Our ability to keep cool (by sweating) and recover over long distances (thanks to efficient breathing) allows us to do extraordinary things with our legs, such as chase down antelope over a period of hours. And so on Saturday I'll run 100 miles knowing this is what my body was made to do. It's what we were all made to do. Take away the thin veil of "civilization" and, really, deep down we're no different than our ancestors of thousands of years ago. Instincts can be buried deep within, but they're always there. I'll be sure to post my time on Sunday and follow up in the coming days with a race report. I recently read a column about the skyrocketing costs of health care and how we need policy changes now or else the system is going to cripple America and bankrupt our government. When are geeky policy wonks going to get it? And when are we as a nation going to get it? Fixing health care costs isn't about policy. It's not about anyone in Washington or state capitals across the country. It's not about the president or your congressional representatives, either. It's not about higher taxes or nationalized health care. And it sure as heck isn't about tax credits, etc. It's about people's behaviors! Health care costs are skyrocketing ultimately because of rising "consumer" demand. Rising demand has two dangerous implications: 1) Eventually your health insurance won't be enough and you're going to have to pay more, and 2) there will be more and more people without health insurance. Both of these will only add fuel to the very misguided nationalized health care movement that treats the symptom, not the root cause. Fortunately, we can avert both if first we just acknowledge the root of the health care problem. And here it is: The rising demand for health care is being driven by a gluttonous, out-of-shape nation (just as high oil prices are driven by greed). It's said that heart disease is the #1 killer in the U.S. It's not. Cancer isn't, either. The #1 killer in America is obesity. If you're obese, you are at much higher risk of heart disease, cancer, diabetes, high blood pressure, kidney disease, joint failure, digestive disorders, sleep apnea and a whole host of other problems. If you're obese and a smoker, your risk factors are even greater. If you carry most of your fat in your midsection, you are wreaking havoc on your organs. Beyond killing you, obesity creates a huge demand for health care, and demand leads to higher prices that few of us can afford to pay. But don't take my word for it. Even our (incompetent) government recognizes the cataclysmic consequences of obesity. And here's more news. Demand isn't just coming from fat adults. There are more obese kids today than ever before. It's unmistakable. Kids with type-2 diabetes and early signs of heart disease...unbelievable! If America wants to "get control" of health care, the solution isn't policy-related and it has nothing to do with the use of taxpayer money. The solution is for people to reduce their reliance on health care by dedicating themselves to healthy eating and exercise, which are the best wellness and preventative measures you can take. The model then must change from a system of sick-care to a system of well-care. As a first step in regaining health and wellness and reducing their risk factors, people can start avoiding refined sugars, red meat, pork products, all fast food, processed foods, fried and fatty foods, excessive alcohol consumption and smoking. They can emphasize whole grains, fresh fruits and vegetables, and fish and chicken, while keeping their feet moving and their TVs and video games turned off! It's a well-known fact that nations that adopt the Standard American Diet (SAD, an appropriate acronym), which is awful, see huge spikes in the rate of heart disease and cancer. But there's also the Standard American Lifestyle (SAL, as in pig)--6 hours of TV a day, video games, Blackberry obsession, inadequate sleep, no exercise and perpetual stress. If we change our behaviors and adopt a healthier lifestyle that gets us outdoors where we'll enjoy exercise, we'll see less and less of our doctor and rely on fewer and few prescriptions. Then, only then, will health care costs go down and will people discover a better life. I know. I made the change almost 7 years ago, when I was a size 38 and on the road to cigarette adiction (thanks to political campaign life). That was 51 pounds and about 16,000 miles ago. My first full week of tapering for the Mohican Trail 100-Mile Run is now behind me. For the week, I ran 54 uneventful miles, including 11 miles on Saturday--with my new Salomon Speedcross 2s, which I love--and 11.5 miles on Sunday with the Cleveland Southeast Running Club. I feel pretty good except for some lingering tightness in my hamstrings. For the coming week, the plan is to do very little--certainly nothing over 30 or 35 minutes. The plan for Thursday and Friday is zero, when I'll be be getting my drop bags in order. Then on Saturday the big event comes--100 miles through Mohican State Park. I have too much respect for 100s for my #1 goal not to be to finish. Looking at my training, I think I've done what I needed to do to be ready for Mohican. I ran pretty good mileage and I think the hill repeats will pay off. I may have raced a little too much this spring, with two 50Ks and a marathon in a three-month period. All I can do is my best. There will be plenty of good runners on the course this weekend and hopefully I'll be finishing with a time I can be proud of. Last night I bought a pair of trail racing shoes that I plan to wear at the Mohican Trail 100-Mile Run next Saturday. I'd been eyeing these shoes for a few weeks, especially as I continue rethinking the kinds of running shoes I should wear (thanks to a very thought-provoking book I'm reading, Born to Run by Christopher McDougall). After much consideration, I forked over $110 for a pair of black Salomon Speedcross 2's, purchased from Geiger's Ski & Sport Haus in Chagrin Falls, a retailer of very high-end outdoor sporting goods. These shoes are light and flexible and have a nice lacing system and some aggressive gripping. Buying light-weight, flexible trail shoes was a big step for me. Usually for a 100-miler I'd buy a substantial, high-stability trail shoe such as the Montrail Hardrocks I bought a few years ago. These Salomons are none of that. They are pure trail racing shoes and my plan is to slip into them after the river crossing at Mohican. I'll be taking them through a few creeks, so hopefully they'll drain well. In case the Salomons aren't working for me, I'll have at least four other pairs of shoes in my drop bags throughout the course. Hopefully I'll stay in the Salomons at least until the last 10 miles, when we get back on roads. I know that lately I've been harping on shoes and what I'm learning about in Born to Run. But it's good to question what we've always considered conventional wisdom. I think of a famous scene in "Dead Poets Society" in which Mr. Keating, played by Robin Williams, stands on his desk and implores his students to always look for a new, different perspective on the world. Right now I'm standing on my desk trying to get a new view of my shoe-buying behaviors. As a guy who used to be 220 lbs. with a spare tire and a few chins, I still feel drawn toward shoes for big guys. You'll see me in heavy stability trainers 99% of the time. Only for road races do I break out my 10 oz. light-weight trainers. It's time that I come to grips with the fact that I'm no longer a burly guy and might just be able to buy shoes for speed. And thus a pair of Salomon Speedcross 2's are now in my possession. We'll see how they work at Mohican--maybe great, maybe not so great. Stay tuned. Anyway, back to running shoes. The question I'm asking right now is what the human foot really needs in the 21st century. Does it need crash pads, motion-control bars, thick in-soles, etc.--or does it just need a thin rubber sole and a basic upper for protection? In other words, should the role of running shoes be to guide--or dictate--the foot's movement, or just to provide basic support and protection as the foot goes through its own natural motion? Too much shoe, I'm reading, can lead to weak feet and, consequently, to a host of injuries to the Achilles, arch, heel, etc. Now I'm wondering if the stability shoes I've always worn--shoes with built-up heels--are causing me to be a heel-striker. With the right shoes, could I be a forefoot striker? Of course, running-shoe companies want us to think we need super-fancy (and, thus, expensive) shoes and that each of us fits into one of three categories--stability, neutral-cushioned and motion-control. From Nike and Asics to Adidas, my beloved Saucony and other companies, they've led us to believe that pronation is a bad thing when, in fact, it's normal and perfectly healthy for the foot. A few days ago I ran an 1/8 of a mile barefooted and I noticed that I instantly changed my form--more compact stride, feet hitting the ground right below my body (as they should), quicker turnover, forefoot striking, etc. You can't heel-strike running barefooted because your foot knows that heel-striking will cause destructive stress. So you naturally correct and run with proper form. Don't get me wrong--I'm not interested in or even advocating barefooted running, but running barefooted will reveal your natural stride. The challenge then becomes finding shoes that allow you to run naturally while providing the basic support and protection you need. Anyway, after Mohican I'm going to experiment with some different types of running shoes to see what I really should be wearing. Given my brief but enlightening barefoot running experience, maybe there's perfect form in me yet. With the Mohican Trail 100 just around the corner (June 20-21), the goal this week was to reduce my mileage 10-15 percent from the previous week's 100.11 miles, while maintaining some good quality in my running--the rationale being that I need some rest and recovery. Mission almost accomplished. I ended the week with 83.2 miles--a 17 percent drop. I'd have gotten to 90 pretty easily but time was limited on Saturday morning--my long run day--due to some family scheduling conflicts. Anyway, at this late stage, there's very little I can do to be better prepared and lots I can do (namely overtrain) to be less prepared. The week saw two excellent hill workouts. On Wednesday, I ran three hard repeats on a stretch of Chagrin Boulevard, followed by a hard effort up the notorious Main Street hill in the Chagrin Falls village, for a total of 9.1 miles on a very hilly course. On Saturday morning, with only 90 minutes to work with, I ran down to South Chagrin Reservation and proceeded to do an out-back-out on a 1.3-mile stretch with four big hills. I pretty much hammered this stretch all three times, and then ran home for a total effort of 12 solo miles followed by 4 more solo miles that night. The next day (Sunday) with my hamstrings and right groin still sore from the previous day's hill workout, I completed 14 miles at easy pace with the Cleveland Southeast Running Club. Sunday's 14 miles marked the end of my first taper week and end of high mileage going into the Mohican 100. From here it's low mileage, rest and recovery. Based on those numbers, the 2008 me would appear to be in better shape than the 2009 me. But there are two huge factors from 2008 that could well mean the 2009 me is better prepared for Mohican. Last year at this time I was getting NO sleep and we were stressed to the max caring for Noah who was one-month-old and afflicted with severe reflux. This year Noah has for the most part been a happy, healthy little guy (except for a few ear infections) and sleep has been a little more plentiful, though still not abundant. I'm probably better off because of the extra sleep and less stress. Also, unlike last year, I now have experience on the entire Mohican 100 course and experience is priceless. We'll see what happens on race day. 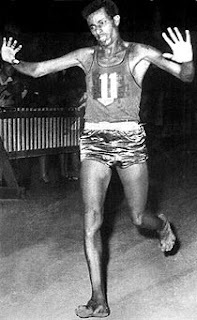 Running barefooted, Abebe Bikila captured the gold medal in the marathon at the 1960 Olympic games in Rome with a then-record 2:15:16. I'm more than half-way through Born to Run by Christopher McDougall. Although I wouldn't put Born to Run in the same class as To the Edge by Kirk Johnson (which in my opinion is the greatest book about ultrarunning ever written), it is nonetheless a pretty good read and has some very interesting chapters on the history of ultrarunning. I especially liked the section on the legendary Ann Trason, who was the top woman at the Western States 100 like 13 or 14 times. McDougall writes of the famous Trason/Tarahumara battle at the 1994 Leadville 100. Trason was leading through 80 miles or so and was then passed out of no where by a Tarahumara, still setting a new women's record of 18:03. Trason was something else--super tough, intense and determined. Here Bikila is nearing the finish line. This is a very famous photo and one of my all-time favorites. The drama is palpable. I've also enjoyed some of the stories McDougall tells of the runners participating in the Copper Canyon 50--Scott Jurek, Jenn Shelton, Billy "Bonehead" Barnett, "Barefoot" Ted and others. Although entertaining and funny, some of these stories are pretty over-the-top and at times I wonder if they really water down the quality of McDougall's book. McDougall is trying to develop his characters--and I'm all for character development--but do I really need to know the life story of Barefoot Ted? McDougall's book is one part circus and one part seriously thought-provoking. He's gotten me thinking about running shoes and whether they really do what the runner needs--which is promote a natural stride while protecting the feet. With my running shoes, I heel-strike and over-stride mostly because my shoes allow me to run with semi-flawed form. Without my shoes and with just bare feet, my form is nearly flawless as my feet hit the ground perfectly in line with my body. With just bare feet, you can't heel-strike because then you'd break your heels. Because barefooted running requires perfect form, many runners who go shoeless have avoided injuries that previously plagued them when they wore running shoes. How much protection do our feet need? Where do we need this protection? Can we have both while running with perfect form? Can the running shoe deliver on all of this?